At a busy Fontana intersection, tempers flared Tuesday when two drivers began to fight in a caught-on-camera moment seen by lots of other drivers. Driver Jonathan Martinez recorded the fight that erupted right in front of his car as he traveled west on Valley Boulevard. "I was going home from work and all of a sudden, you know, I saw the people get out the car and start fighting and I'm like ‘What happened?’ and I started recording," Martinez said. He saw a man get out of an SUV parked in the right lane, run over to a truck and begin fighting with a man in the passenger seat. The brawl spilled out into the roadway and the female driver of the truck also joined in. Martinez didn't see exactly what led to the street fight, but he doesn't believe the people in the two vehicles knew each other. “For sure it was road rage. You should have seen the other guy looked all mad. Somebody cut him off or driving too slow," Martinez said. The fight lasted about 25 seconds and ended after two other men intervened. It appears no one was seriously hurt, and Martinez said everyone got back into their vehicles and drove off. 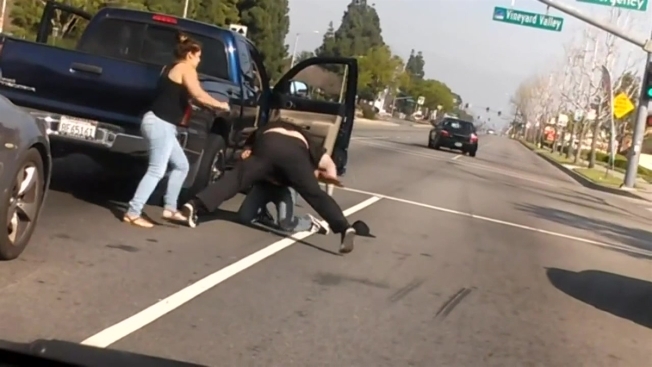 A California Highway Patrol spokesman said the fight was concerning. "It's very upsetting that it goes this far," said Officer Travis Monks. He said if it was a case of road rage, it’s an example of why drivers need to back off and stay in their vehicles, especially if someone is acting violently on the road. "You don't know what they have. They may have a knife, they might have a gun. You don't know what type of mental state they are in," Monks said. Martinez, who recorded the incident, isn't sure who is at fault for this fight, but he said regardless it should be a lesson for all drivers. "They need anger management. It's not right. Everybody should just relax," he said.